As a professional in the health and nutrition field, Lindewe knew that to keep her strength up she would have to keep her diet filled with the kind of nutrition not always available at her shelter. “They serve a lot of filling foods, but it’s things like macaroni and cheese,” she says. Lindewe, who is also vegetarian, knew right away she would have to find meals that would sustain her through this rocky time. 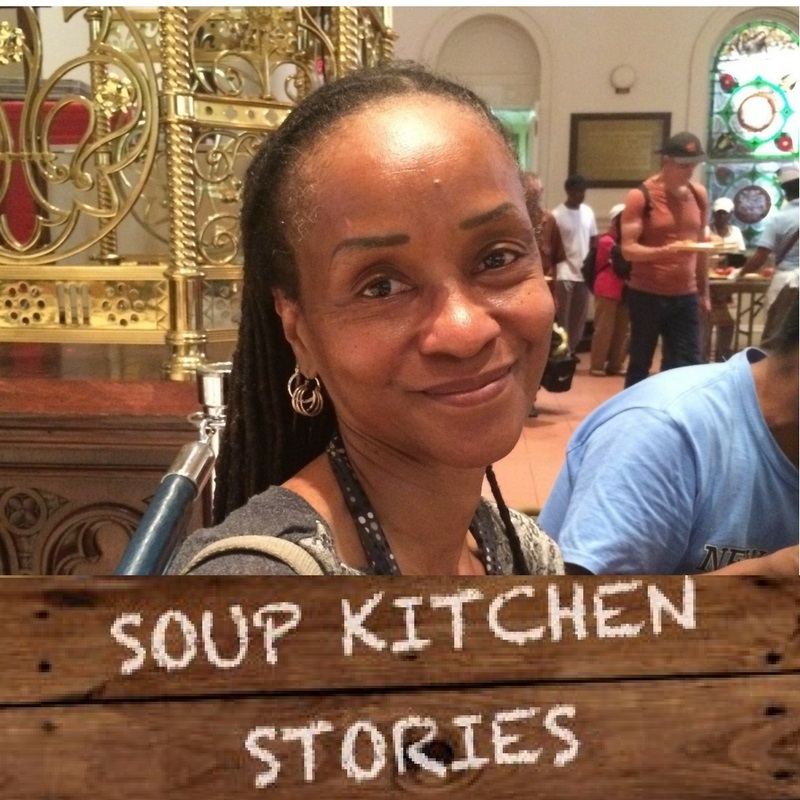 Searching on-line for alternatives, she found Holy Apostles Soup Kitchen and noted its commitment to U.S.D.A. guidelines, food sustainability and how we source fruits and vegetables from New York state farms for every meal. That’s high praise, considering Lindewe’s professional background! His motivation for coming back each week is simple; he loves being of service to others. What really sets Holy Apostles apart, Allen says, is the welcoming atmosphere and the kindness of the many dedicated volunteers. Aspiring substance abuse counselor Markus first came to the soup kitchen a year ago after moving to New York from Rhode Island. He had just been accepted into an NYC program that provides housing assistance and other government benefits to people living with HIV and AIDS. But with no financial safety net to fall back on, and limited support through the program, Markus soon realized he was not able to afford to buy food and was struggling to provide for his needs. 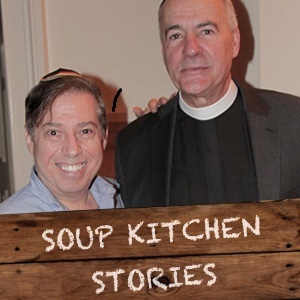 One day while walking down 9th Avenue he saw a line of people stretching down the sidewalk in front of the soup kitchen and decided to go inside. 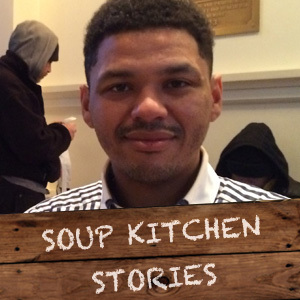 For Markus, the soup kitchen has provided more than just a daily meal. As a full time-student, the haircut and clothing vouchers help him look nice and well-groomed for class, and he enjoys the company of the “fabulous staff” and volunteers. A recovering addict, it has also provided a positive environment that motivates him to stay clean. Today, Markus, who just turned 30, is optimistic about his future. He has his own small apartment in the Bronx and is only three months away from finishing his certification to become a Certified Alcohol and Substance Abuse Counselor. “A lot of my family has substance abuse issues,” says Markus, “and drug use is how I became HIV positive. I want to help others like myself.” He also hopes to start volunteering at the soup kitchen soon. 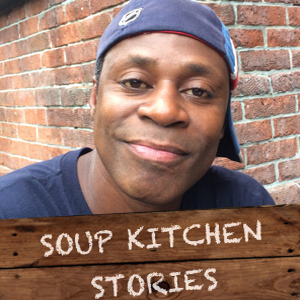 Maurice was homeless and living with HIV when he first came to the soup kitchen back in 2007. He learned about it from a friend at Gay Men’s Health Crisis, a nearby HIV/AIDS prevention and advocacy organization. Maurice, who just turned 52, says the soup kitchen played a role in helping him get his health under control. “It gave me structure during the daytime, and a place to have nutritious meals. Having HIV requires good nutrition,” he says. His HIV has now been undetectable for seven years. Thanks to our social services counselors, who helped him acquire a City ID Card and referrals for other services, Maurice is now no longer homeless and lives in an apartment, funded by the HIV/AIDS Services Administration (HASA). “I’ve always been very involved in the community,” says Maurice, who currently serves on the HIV Planning Council, a coalition of people living with HIV/AIDS, caregivers, government representatives, and other community members. Today, with the help of the soup kitchen, Maurice has reached a place of greater health and stability, and he believes everyone has the ability to overcome difficult circumstances. On many mornings, Philip will arrive early, bundled up for the cold weather and greeting other guests with a smile and a word of encouragement. A retired Parks and Recreation Director on a limited income, Philip isn’t comfortable just having a meal here without giving back. “I’ve donated some of my old clothes…things like that,” he explains. “I’ll get a hot meal, and that helps, but a lot of what I am thankful for is the social part,” he explains. For Philip, this civic minded way of thinking can be traced back to a lifetime of public service and leadership as a Parks and Recreation Director, a youth hockey coach and team sports. After earning a degree in physical education, Philip enjoyed a productive career with both the New York City and New Rochelle Parks and Recreation departments. His lifetime contribution to the the well-being of countless New Yorkers, from the young athletes he coached to older adults who found happiness and health because of his leadership in their local parks and recreations programs is immeasurable. We are seeing more New York retirees like Philip join us regularly for their daily meals. In fact, in our latest survey, over 14% of guests reported they are over the age of 65, a 4% increase since 2014. 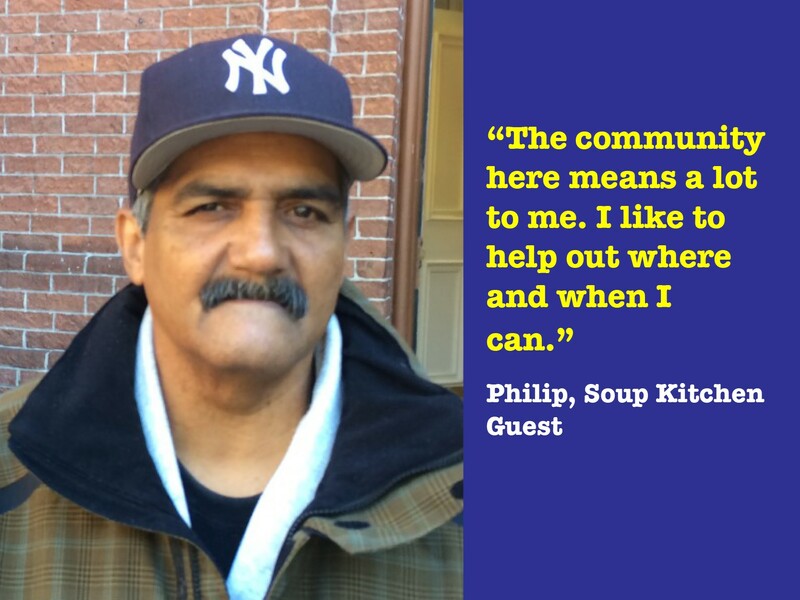 Like Philip, who has contributed so much to society, they too are struggling to make ends meet in New York City on limited retirement incomes. Sitting down for a meal alongside the most vulnerable and homeless New Yorkers, Philip is one of these many senior citizens who are valued members in our community, offering motivation, hope and wisdom to others. Two years ago, Anthony was enjoying a successful career in wardrobe, set design and acting for film and tv. Originally from Delaware, where his mother was a college professor of Communications and his father ran a small construction company, Anthony grew up in a loving, comfortable home. He was encouraged to develop his creativity, work hard and put his best foot forward in everything he did. Sadly, when he was still a young man, both his parents passed on within a few years of each other and Anthony, with no brothers and sisters to lean on to help, coped with his grief by travelling the world, wanting to experience life to its fullest. Always optimistic, he had faith that between trips he could always find new gigs on tv and film projects.That formula worked for several years before he finally settled down in New York with a long term job on a major television network tv show in New York. Never one to give up hope, Anthony refused to think about the worst case scenario. But with no income, and no new job prospects in the competitive show business industry, Anthony soon saw his bank account dramatically shrink until he finally had to use his security deposit to pay for a final month on his apartment last June. Since then, he’s been living on the street, homeless, and without family to turn to. Anthony’s been putting one step in front of the other ever since. Not feeling safe in the crowded shelter system, he started sleeping on the subway at night, and coming to the soup kitchen during the day for his midday meal. Anthony’s perseverance, combined with the help from the soup kitchen will hopefully pay off before the winter months set in. He’s just recently gone to several job interviews for customer service positions and one job looks especially promising.